Nectarines are peaking right now. They are incredibly delicate and delicious. Their deep crimson complexion softened by a wonderful hint of peachiness is irresistible. They are just the right sweetness and must be eaten the moment they ripen for optimum pleasure. Walk by a fresh display and see if you can resist their gorgeousness. 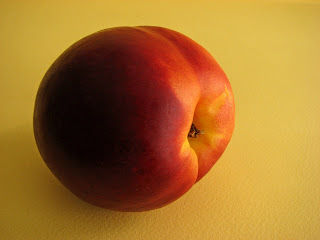 I was thinking about a way to keep the fresh juicy quality of nectarines in tact while adding a spicy flavor profile. I decided to recline them on a bed of mascarpone cream slathered on a gingersnap. Once assembled, the nectarines are bathed in a wash of caramel to complement the fruit and the not very sweet but very spicy cookie. The mascarpone creates a soft pillow of lemony creaminess to bridge all the elements in a simple yet very satisfying way. The gingersnap cookie comes from Chez Panisse, where they are sliced in very thin slivers, topped with coarse sugar and might accompany lime sherbet or passionfruit ice cream. In addition to the usual ground ginger, there is cinnamon and a good measure of black pepper to warm the palate. The mascarpone cream is blended with a bit of sugar, plain yogurt and lemon zest to brighten the entire assemblage. The small stream of bittersweet caramel adds only a hint of gooiness. This is another one of those summer desserts that requires very little fuss. It’s light enough to indulge without care and yet interesting enough to satisfy the quest for an elegant fresh fruit treat. - The gingersnaps are not very sweet. When baking just as a cookie, coat the tops of them with coarse sugar before baking. Check them carefully to be sure the edges do not burn. - The yogurt should be full fat. If it’s nonfat, I add 2 T of cream to smooth it out. You can substitute sour cream for the yogurt for more richness and body. Taste to see if you need to adjust the sugar. - This would also be good with bananas. Add the sugar and beat until smooth. Scrape down the sides of the bowl. Add the vanilla, molasses and combine. Add the egg. Add the dry ingredients and mix just until blended. Flour your hands and lightly dust a piece of parchment paper. Place dough on the parchment paper. Roll the dough until it’s about 2" in diameter. Remove excess flour and roll up the cookie log in the parchment paper. Wrap tightly in plastic and refrigerate until very firm or freeze. Slice into a 1/4" cookies with a sharp knife. Press into a bowl of coarse sugar and place 12 on a baking sheet lined with a silpat or parchment. Bake for 10 minutes, rotating the baking sheets at the 5 minute mark. Bring 1/4 C water and sugar to a boil. Cook for 3-4 minutes until the mixture begins to turn a medium amber color. You will be able to begin to smell the flavor. Pull off the heat and watch as it continues to darken. When it nears the right color, add the 1/4 hot water to stop the cooking, holding the pan away from you as it might sputter. Swirl the pan to combine and until it reaches the desired color. Pour into another heatproof bowl to cool to room temperature. 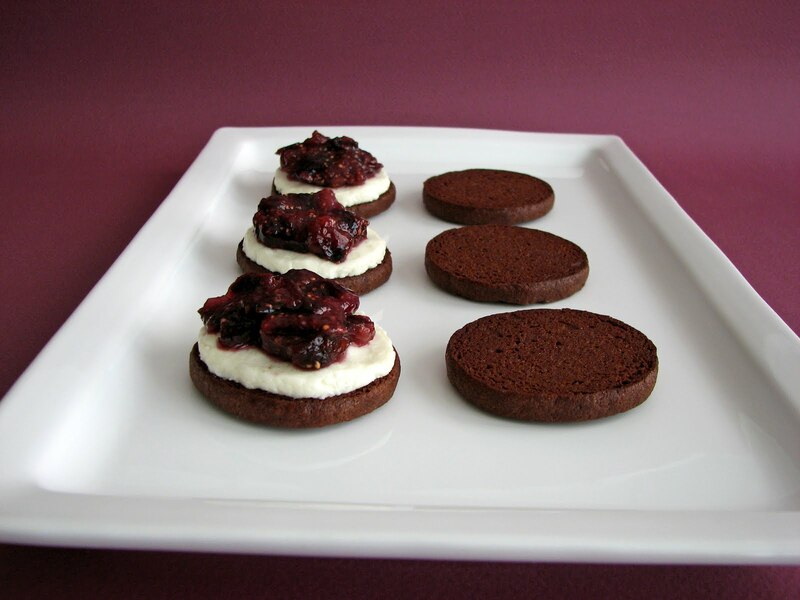 To assemble: Place a Gingersnap on a plate and dollop with Mascarpone Cream. 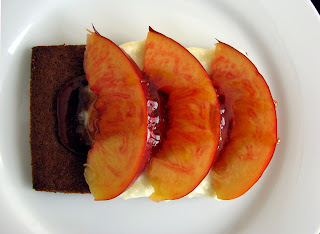 Top with slices of fresh ripe nectarine. Drizzle with caramel. Summertime requires spongy cake and lemon and berries. 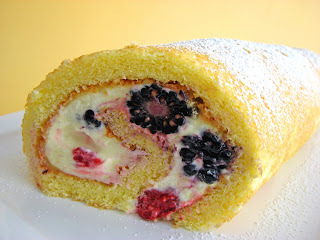 So how about a Lemon Berry Roulade? The combination of light sponge cake, lemon cream and fresh berries seems perfect for the season. A roulade is a great dessert when you’re looking for a celebratory cake that doesn’t require rich frosting or too much heavy filling. The thin sheet cake bakes very quickly and the plain simplicity of the cake means you can fill it with just about any flavored cream you desire. 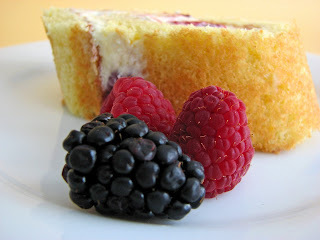 One of the best complementary flavors for tart berries is tart lemon and since berries are looking so good right now, I opted to go with some luscious raspberries and blackberries along with a layer of lemon curd and lemon cream. Presto, a simple and great no fuss gift for any summer table. 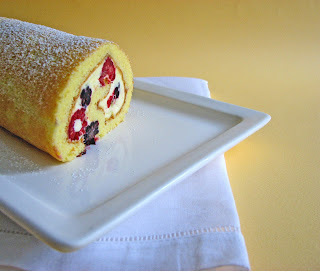 - This sponge cake is very easy to roll. It doesn’t crack and doesn’t require pre-rolling in a towel when you take it out of the oven. The teaspoon of baking powder gives it a great flexibility. - Lemon curd can be made ahead and stored in the refrigerator in an airtight container for a day or two. - When spreading the cream filling on the cake, leave about an inch around the sides and the edge nearest you and about 2 inches at the edge furthest from you. This will prevent the filling from squishing out as you roll the cake. - The fun of this is that you can fill the sponge cake with whatever filling you like. The possibilities and combinations are endless. It’s great simply unadorned or you can pour chocolate glaze over it. 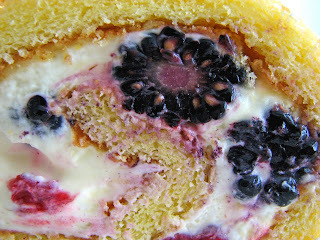 - Be sure to chill the roulade thoroughly before slicing. If you’re worried about handling it, you can also freeze it for a few hours. When ready to serve, remove the plastic and parchment and trim the ends. Bring to room temperature. Combine lemon juice, zest, sugar, and eggs in a heatproof bowl and place over a bain marie on a low simmer, making sure the bowl does not touch the water. Cook for 6 to 8 minutes until thickened, whisking to cook evenly. Take off the heat and add butter. Whisk until smooth. Pour through a strainer into a clean bowl. Cool. Place a piece of plastic wrap on the surface and chill thoroughly. Prepare a half-sheet baking pan (roughly 17 3/4” x 12 3/4”) with a piece of parchment paper, butter and a dusting of flour. Sift cake flour and baking powder together. Warm milk and butter together until butter melts. Cover to keep warm. 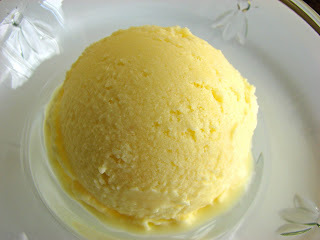 Place eggs and sugar in mixer bowl and heat over simmering water until sugar dissolves and mixture is warm to the touch. Beat until the mixture is thickened and tripled in volume. A ribbon should hold for at least a second. Sift flour over batter in thirds, folding gently after each addition. Add warm milk and fold gently. Pour into prepared half-sheet pan, spreading evenly. Bake @ 400 degrees for 10 minutes. The cake should spring to the touch. Sprinkle the top of the cake with a light dusting of powdered sugar to prevent sticking. Turn out the sponge cake onto a large piece of parchment paper. Carefully peel off the bottom parchment paper and place another clean piece of large parchment paper on top of the cake. Then, placing the baking pan on top of the parchment paper to help steady the cake, flip the cake back over so the top is facing up. Divide the lemon curd into two equal parts. Whip the heavy cream to soft peaks. Fold gently into half of the lemon curd. Place the cake before you so the long edges form the top and bottom. Spread the lemon curd onto the sponge cake, stopping about 2” from the edge furthest from you. Now top the lemon curd with the lemon cream, stopping about 1" to 2” from all the edges. Sprinkle the lemon cream evenly with berries. Using the parchment paper to help control the process, carefully roll up the sponge cake tightly, applying very light even pressure. Roll the cake up in the parchment and place the cake seam side down. Wrap in plastic wrap and chill thoroughly. When ready to serve, carefully remove the plastic and parchment. Trim the ends and place on a serving platter. Dust lightly with powdered sugar. My love of figs and goat cheese as well as the friendly pairing of chocolate with either one of these ingredients led me to the idea for this cookie. Summer always presents the best of farm fresh figs and fresh artisan goat cheese and I know chocolate is a natural with both, so I went with it. It's kind of a sublime fruity San Francisco Oreo without the super sweet glut. 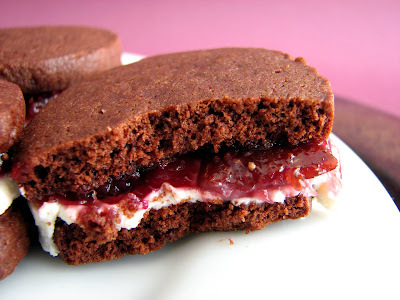 I start with a basic chocolate cookie that has a crisp texture and a deep cocoa flavor. 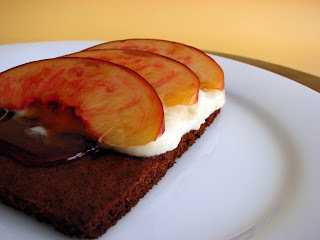 I add a layer of goat cheese that has been sweetened with just enough honey to balance its acidity with the cocoa. Then I slather a fresh fig jam that bridges the two in a way that seems like a very perfect sum of its parts. If you love these ingredients separately, you’ll certainly love this trifecta. All the elements are in perfect harmony. These cookies would make a great end to a very simple and light summer meal that draws on the strands of the freshest summer ingredients. They are a celebration of the gorgeousness of figs at this moment of the season in my region. I hope you’ll have the curiosity to try them and the inclination to share them with your very best friend. - You can toss in another flavor to the fig jam if you wish. I sometimes add a teaspoon or two of rosemary simple syrup in place of the sugar. Or you can try a lavender syrup or crushed anise seed in small amounts. I’ve also added a twist of black pepper right before I sandwich the cookies. Just be sure to keep it simple and let the figs shine through. 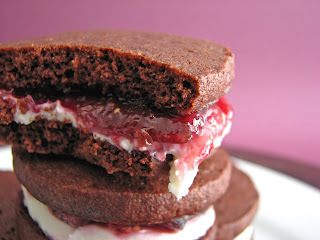 - I originally made these cookies with chocolate macarons parisienne. Although I thought the almond flavor was a nice complement, I found them too sweet. So I prefer these chocolate cookies for their deep cocoa flavor and their just-perfect level of sweetness and earthiness. - Serve these cookies immediately. If allowed to sit for more than an hour or so, the cookie will become soft. This may be desired or not. It’s up to you. Sift cocoa and spoon into measuring cup to get 3/4 C or 2 oz. Sift together flour, cocoa, baking powder and salt. Beat butter and sugar together for 2 – 3 minutes until smooth. Add egg and vanilla and beat for another minute. Add dry ingredients on low speed and mix for about a 1/2 minute or so, just until combined. Divide dough into two parts and place each on a piece of parchment paper. Gather the dough and form into 12” x 1 1/2“ logs, rolling up in the parchment paper. Wrap the logs tightly in plastic wrap and freeze. To bake, preheat oven at 350 degrees. Slice dough into thin 1/4” cookies and bake @ 350 degrees for 10 minutes. Cool completely. Chop the figs and place in a saucepan with the water, sugar and raspberry jam. Cook on low heat until the figs are soft and juicy, stirring to prevent scorching. Pull off the heat and adjust sweetness. Cool. Combine the goat cheese and the honey and stir until completely blended. 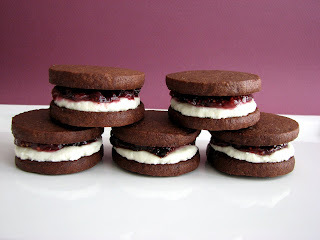 Assembly: Spread a thin layer of goat cheese filling on a cookie. Top with some fig jam. Finish with a second chocolate cookie. Serve immediately. A few years ago I discovered the subtle beauty of Noyau Ice Cream. Noyau is the French term for fruit stone and it is also the almond-like kernel inside apricot pits that flavors this ice cream. It gives a very soft flavor of almond yet seems to taste a bit different. Its dreamy pale color is a shade darker than vanilla. 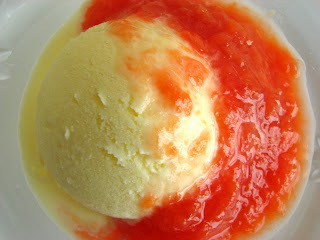 As I mentioned in a recent apricot recipe, I save apricot pits each season to make this ice cream. It somehow manages to remind me of the essence of summer, the quintessential stretch of time full of churning ice creams and sorbets for idyllic pastry menus. If you're like me, once you've tried this recipe you won't ever simply toss those apricot pits again. 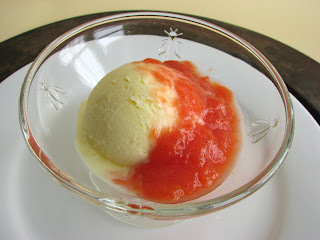 - As you might guess, this ice cream is delicious with apricots, cherries or peaches, or any pastry made with these fruits. I can also imagine it with figs. Chocolate would overpower it, but who's to say? - Wash the apricot pits and let them dry. They can be stored at room temperature for quite a long time. - The kernels should not look shriveled or dry. They should give off a fairly strong scent when crushed or chopped. If you break a kernel open and it does not give off a scent, it's past its prime. 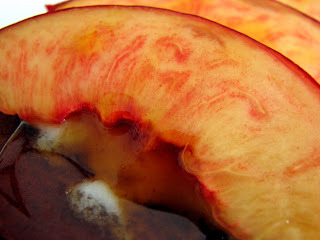 - I left the nectarine skins on for color and then strained them out. Peel them before chopping if you don't want to go through this step. 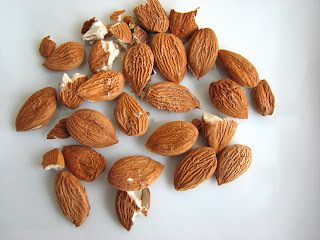 Break open apricot pits with a hammer to remove the small almond-like kernels inside. You may want to use a cloth to keep the bits from flying. Crush the kernels with a mortar and pestle or chop into small pieces. Place the sugar, milk, cream and kernels in a saucepan and heat right up to a good simmer but just before it boils. Cover and let the mixture steep for 30 minutes to an hour, tasting periodically to check for strength. It should taste of almond, but not bitter. When you have the desired flavor, heat the milk mixture a bit and pour some of it into the yolks, whisking constantly to temper the mixture. Pour the yolks and cream back into the pan and cook slowly over medium heat, stirring constantly, until it coats the back of a spoon. Strain into a clean container and cool, stirring occasionally. Chill thoroughly. Pour into your ice cream maker and freeze. Pour into a clean container, cover the surface of the ice cream with a piece of plastic wrap, be sure the container lid is tight and place in your freezer to firm up. Pit and chop the nectarines. Place in a saucepan with the remaining ingredients. Cook over low heat until juices are rendered and the nectarines are soft, adding water if needed. Adjust lemon juice and sugar for flavor. Remove from heat and cool. You can leave the sauce chunky or blend it for a smooth texture.